1 lb yellow potatoes cut in bite-sized pieces. 1 red onion diced and separated. 1 green bell pepper diced. 4 cups kale chopped and stems removed. Combine the potatoes, 1/2 of the red onion, jalapeño, bell pepper, olive oil, paprika and chili powder in a bowl. Stir to coat evenly. Spread mixture out on the baking sheet and sprinkle with salt and pepper. Place in the oven and bake for 20 minutes. Remove from the oven and flip. Cook for an additional 10-20 minutes*, or until potatoes are crispy and veggies are soft. 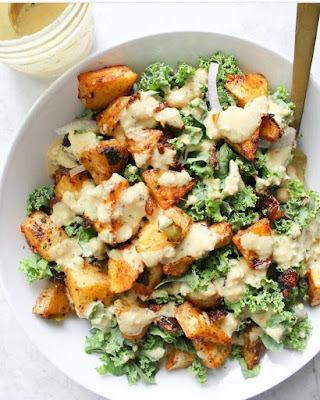 While the potatoes are cooking, combine all of the dressing ingredients in a bowl and stir to combine. Taste and adjust seasonings as needed. Add water until desired consistency is reached. Place in the fridge until ready to use. After you make the dressing, place the kale in a large bowl and sprinkle with lemon juice. Massage for 30-60 seconds, or until the lemon juice is incorporated and the kale is soft. Place in the fridge until ready to use. Remove the potatoes from the oven and sprinkle with additional salt, if needed. Assemble bowls by layering kale, the remaining raw red onion and potatoes. Drizzle with dressing and serve.